Muir Boat House is an Emily Muir designed contemporary home on the rugged coastline of Crockett Cove Wood Road in majestic Stonington, Maine. The home provides the feel of a boat with dramatic views of Crockett Cove, Rabbit Island and the Penobscot Bay. Muir Boat House is a four bedroom, one and a half bathroom home in a secluded and quiet setting in Stonington. The home was designed and built by the famous, artist and contractor Emily Muir. The home is full of natural light with gorgeous aquatic scenery from most every window you encounter. The home is on the outskirts of the Crockett Cove Wood Preserve which makes this a quiet and peaceful setting. The main section of the home houses the living room area, the dining room with a table for six and a galley style kitchen with a combination of open and closed cabinetry. The first two bedrooms are off the kitchen and dining area. The first bedroom has a full size bed with glorious western views over the bay. The second of these bedrooms has two twin beds with a dresser and closet. Muir Boat House has two additional bedrooms and a bath and a half in the other wing of the home. The third bedroom has two twin beds with a dresser and the fourth bedroom has a full bed with a closet and dresser. There is a half bath and a full bathroom in this section of the home. The Muir Boat House is a one level living option. There is a lovely deck on the side of the home with two lounging chairs and a four person patio set with umbrella. The homes unique design makes this accommodation very special and extremely sought after. 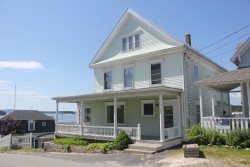 Please inquire with us today to book your vacation in this splendid Stonington property. The Island Agency folks were very pleasant to deal with. Would rent thru them again, although would not rent this property again. Wonderful home in stunning location. The house is basically amazing, and we loved being there, aside from power outage and lack of internet. Some upgrades in furniture and decor would make a big difference. It was just perfect. The kids had a blast (wifi was not missed!)! Kitchen was awesome. The stars were spectacular. It was just perfect. The kids had a blast (wifi was not missed!)! Kitchen was awesome. The stars were spectacular. I saw a seal right from the deck. Too cool.